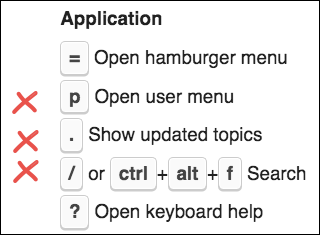 Anyone else having trouble getting the Forum keyboard shortcuts to work in Google Chrome? All seem to work fine in Safari. I very often using "p" to "Open user menu", aka, "Notification List", but it hasn't worked for several days now. Running Google Chrome 73.0.3683.86 (3683.86) on macOS 10.12.6.